Connect the speed of life to a gentle flow. Where 'around the world' is just around the corner. Savour a more enjoyable lifestyle. Where you can blaze your own trail. Where a 'different path' always leads you home. Introducing Capstone at Riverlands: a revolutionary masterplanned urban community designed for easier, more balanced living. Nestled along the banks of the Red Deer River, this city within a city will be home to condos and townhomes, hotels, offices and retail, shopping and dining, arts and culture. Step out your door and onto a nature trail. This is community re-imagined. 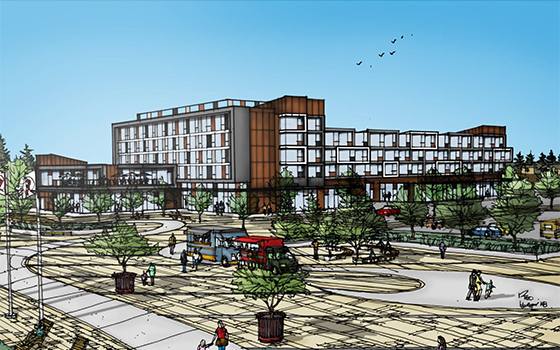 The City invites experienced developers to submit proposals for the Capstone at Riverlands Hotel Development Project. The Capstone at Riverlands community offers an extraordinarily rare opportunity of undeveloped riverfront land in a city’s downtown core. Developers are invited to submit a proposal for the Capstone at Riverlands Mixed Use Residential Development Project. Located in Red Deer, Alberta, Capstone at Riverlands offers an extraordinarily rare opportunity to develop prime riverfront land in a city’s downtown core. We recently engaged with some Red Deer bloggers to help highlight the local businesses in Capstone at Riverlands, encouraging them to spend the day enjoying the amenities the district currently has to offer in whichever way felt natural. Put the rush of the world behind, and a sense of pure calm in front. Live where you work, and exchange commute time for more downtime. Turn every day into a new adventure! Spend less time going, and more time doing. Step around the corner and find inspiration from around the world: quaint cafes, excellent restaurants, one-of-a-kind shops and boutiques, art galleries, and great public spaces are all yours to explore, right in the community! Or, hop on a bus or follow the footpath into historic downtown for even more dining, shopping and cultural options. There’s always something new to discover around here.